Golden Globe award-winner Andy Samberg spent his first two years of college at UC Santa Cruz in 1996-98, during which he worked as a ticket-taker at the old Del Mar movie theater in downtown Santa Cruz. 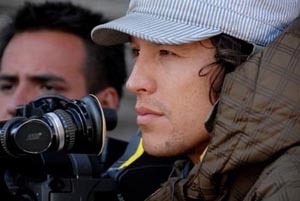 Cary Fukunaga--who graduated from UCSC in 1999 with a B.A. in history--first gained notice when he received the best "Directing, U.S. Drama" award at the 2009 Sundance Film Festival for his debut feature film "Sin Nombre." 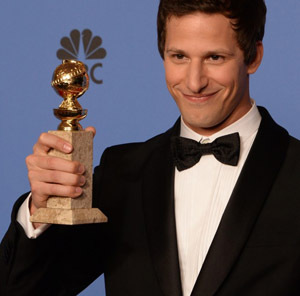 Last night, former Saturday Night Live cast member—and now TV star--Andy Samberg picked up a 2014 Golden Globe Award for Best Actor in a TV Series Comedy for his new show, Brooklyn Nine-Nine. The freshman show on FOX also received the award for Best Comedy series, beating out Girls, Modern Family, Parks and Recreation and The Big Bang Theory. It also happened to be the premiere of one of the most highly anticipated television shows of the new year. That would be True Detective on HBO—directed by UC Santa Cruz alumnus Cary Fukunaga—and starring Woody Harrelson and Matthew McConaughey (who also picked up a Golden Globe last night for best actor in a drama for Dallas Buyers Club). Fukunaga--who graduated from UCSC in 1999 with a B.A. in history--first gained notice when he received the best "Directing, U.S. Drama" award at the 2009 Sundance Film Festival for his debut feature film Sin Nombre. He wrote and directed Sin Nombre, based on his own firsthand experiences with Central American immigrants seeking a better life in the U.S.
Two years later, he followed that auspicious beginning with Jane Eyre, Fukunaga’s own take on the classic 1847 novel by Charlotte Bronte. That film featured Australian actress Mia Wasikowska (Tim Burton’s Alice in Wonderland, The Kids Are Alright) and Irish actor Michael Fassbender (Quentin Tarantino’s Inglourious Basterds, HBO’s Band of Brothers).